Target's electronics employees looked through their 'Nintendo Wii Promo Binder' and acted like they knew nothing, which they didn't. They had no way to look up when they would receive the title. Sears electronics department stated that they are a small retailer and likely would not receive DQ Swords at all. They also had no way too look up if and when they would receive the game. GameCrazy reserved out their only copy. They had no way too find out if and when they would get more copies. Wal-Mart checked their back room and told me "out of stock." EBGames checked their computer and said they would have 2 copies available for purchase tomorrow. Best Buy had copies of the game in the back room, but stated that it was not set for release until February 21,2008. So, alas, I was struck down like a slime. 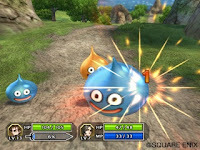 No Dragon Quest Swords early availability after all. When a game is released, that usually means shipping date. You'll have better luck finding it today, when it'll be certain to have arrived at many retailers. You had some really bad luck; my Game Crazy had it on the 18th, with several copies left after I bought mine.